﻿ Best Price on Allamanda Beach Resort in St Georges + Reviews! 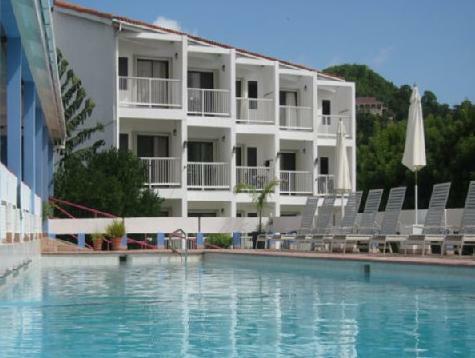 Offering an outdoor swimming pool and a restaurant, Allamanda Beach Resort is located right in front of Grand Anse Beach. Free WiFi access and free private parking are available. Each room here will provide you with air conditioning, a balcony and a cable TV. Complete with a refrigerator, the dining area also has a coffee machine. Featuring a shower, private bathroom also comes with a bath or shower. Extras include a desk, a safety deposit box and ironing facilities. At Allamanda Beach Resort you will find a tennis court and a fitness center. Other facilities offered at the property include meeting facilities, luggage storage and laundry facilities. An array of activities can be enjoyed on site or in the surroundings, including golfing and snorkeling. Point Salines Airport is 2.5 mi away. I was happy with this and I would stay there again. It was a bit expensive but I had to book last minute so that's fair enough. Das Allamanda Beach Hotel liegt direkt am Strand. Trotzdem ist man direkt im Touristenzentrum. Abends kann man dann an der Hauptstraße entlangbummeln, in den Geschäften einkaufen gehen und die unterschiedlichesten Restaurants besuchen. Mit der Taxe ist die Altstadt innerhalb von 10 Minuten zu erreichen. Der hoteleigene Fitnessraum ist gut bestückt, der Swimmingpool ist ist in den oberen Stockwerken und dort kann man sich von der Hitze des Tages abkühlen.